. كما يقدم The Hotel Charsfield الكثير من الخدمات لإغناء رحلتك في ملبورن. تتضمن الميزات الرئيسية في هذا الفندق: خدمة غسيل ذاتية, مجهز لذوي الإحتياجات الخاصة, مكتب الاستقبال على مدار الساعة, مرافق مخصصة لذوي الاحتياجات الخاصة, صف السيارات. بالإضافة لهذا,تتضمن كل غرف الضيوف مجموعة واسعة من وسائل الراحة . بعض الغرف توفر حتى تلفزيون بشاشة مسطحة, اتصال لاسلكي بشبكة الإنترنت (مجاني), حوض الاسترخاء, غرف لغير المدخنين, مكيف هواء لإرضاء أكثر الضيوف تطلباً. يقدم الفندق العديد من الفرص للاستجمام كمثل تدليك, بلياردو, حديقة, غرفة ألعاب. يشكل The Hotel Charsfield بخدماته الراقية وموقعه الممتاز، قاعدة مثالية للاستمتاع بإقامتك في ملبورن. يوجد موقف للسيارات خارج منطقة العقار لقاء 20AUD في الليلة. يجب حجزه مسبقاً. My husband and I recently spent a night in the Charsfield Hotel as we had a function nearby. This boutique hotel is 5 mins from the city centre by tram but a very pleasant walk if you don't have a lot of luggage. The hotel has everything going for it -old mansion, beautifully refurbished and nice garden out the front. We were thrilled to receive a free upgrade to a 2 bedroom apartment; it was spotless, large and airy but best of all very quiet to ensure a great night’s sleep. We will be back! we stayed at the charsfield for new years eve this year and it was possibly the best decision made of our entire trip. we had to leave early in the morning to fly to tasmania so we had an amazing 3 course meal at the charsfield restaurant. they even let us take our desert back to our room as we were too full to eat it straight away. upon asking for directions to the airport without going through tolls the receptionist printed us a step by step map/guide and delivered it to our room. the services was friendly and efficient, the rooms spacious, comfortable and clean. the bathroom was very small but as we didn't spend much time in there it was not a problem. location is in between the city and st kilda with just a short tram ride to either lively location. loved it and will definitely be back. A little bit far from downtown, but in return the air is much better. Even though, access to downtown is easy by using the tram just outside the hotel, for a 10mins ride. Sadly there are very few shops within 5mins walking distance that it is somehow in-convience for buying anything. This cozy period hotel was just as I expected when I first booked it online. It was well maintained and has the amenities one would expect from a 4 star hotel. The staff were very friendly and helpful. There were reading rooms and a snooker place. There was also the laundry machine which we used since we're traveling for a couple of weeks and needed some washing to do. The location was very convenient. Not really at the heart of the city but very accessible via tram. I had to ask for another room. The first was on the ground floor with a view to a non charming parking lot. The staff is very friendly and helpfull. But in my opnion is the rooms overprized. The location is very good near tramps. The hotel is also very close to the beautifull Botanic Garden. The cabinets in the room do not complement the charm of being an old home. I had a late evening flight so killed time in the reading room which was cozy. It had nice photos and a write up of the original owners which satisfied my curiosity on the history of the place. The staff where quite freindly and helpful. There is a tram stop a few paces away and takes one into the city in about 10-15mintues. I had an enjoyable stay at Hotel Charsfield. The Hotel has great character and a good location. Tram stops are nearby and though convenience stores, cafes and restaurants were a short walk away. My room was quite small but as I was staying alone, it was adequate, though I wouldn't come back with my partner. The reception staff were incredibly helpful and friendly. Great place to stay. Half way between Melbourne CBD and St Kilda (5 mins by tram each way)with a tram stop 2 mins walk away. We chose it because of its character and location as it meant we would have to make use of the trams which was part of the fun for our son aged 8. We stayed in the 2 bedroom apartment which was great for us as a family - privacy, self-contained, plenty of space, 2 bathrooms, great kitchen facilities. The only downside was the intermittent internet service in our apartment and the out-of-date browser on the hotel's public-use computer. Couldn't fault the hotel and would stay there again and recommend to others. Loved the Charsfield Hotel, great situation, tram stop just outside the hotel, but only a 30 min walk to the city center, just a walk away from the Botanical Gardens. Staff are very friendly and where very helpful and well informed. Lovely light airy rooms very clean and well equipped. lovely décor and beautifully furnished. A little bit surprised that there is no mention of a fee of $22 per night for car parking on website. 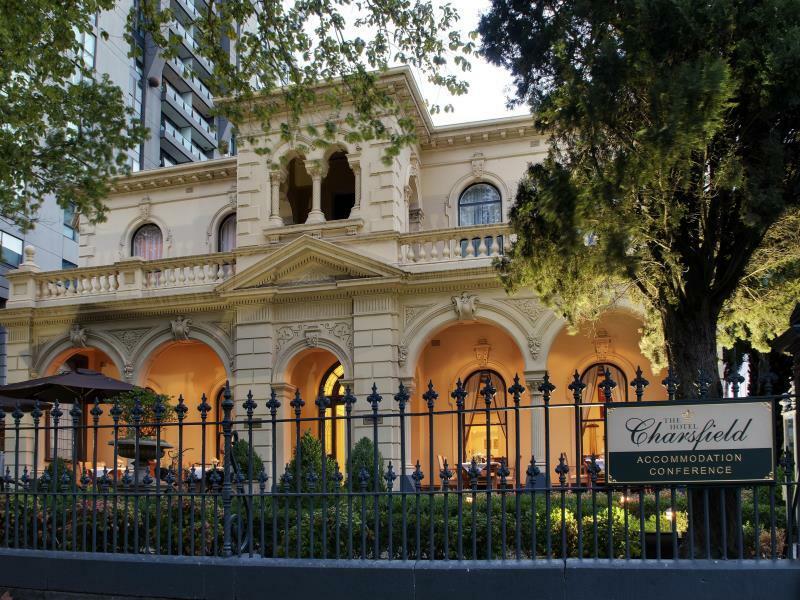 1.Hotel Charsfield is well positioned on a main tram and road link to the CBD a 5 minute ride away. It exudes understated quality and is well appointed and well run. We were greeted by friendly staff who had our Agoda booking at hand and were prepared for our requested early check in. The room was everything it was indicated to be. Large with high ceilings, very comfortable bed and well appointed bathroom. We particularly liked the Olde World Ambience of this hotel in a heritage building. It is well positioned nearby to shops and restaurants, Albert Park and the Alfred Hospital should one need to visit patients there. Only one disappointment was they don't serve tea and scones on the extensive verandah. That would have been the cherry on t,op of the cake! We would rank this hotel as very highly recommended for personal and business travellers. It was perfect. It is in such a lovely part of Melbourne and the old building is so charming. The rooms were well equiped and had everything you could want except a view, but the charm of things well and truely outweighs a modern hotel with a view. Sitting outside on the terrace watching the world go by is unique at the Charlsfield as are the lovely old stair cases and fittings. All the comforts have been thought of and I would definately return there again instead of staying at the Hilton or Sofitel. This is more intimate. I was in Melbourne and the Charsfield was close by to the office. Plenty of places around to go an eat and whilst right on the tram line it was a nice 20-25 minute walk to Flinders St. The facilities and charme of the old building were fantastic. generally good, helpful/friendly staff, quite room, close to tram station and 7-10 mins drive to city, easy 1hour parking outside (if you want overnight parking it will charge you about $22/day) on the last night we stayed, that was bit of noise from the next room which i think was someone making it from the bed. Its a pity we didn't spend a lot of time in the hotel because the interior is indeed very tastefully decorated and there is a nice and neat garden outside. It would be nice to have tea out on the verandah on those cosy chairs and tables. I strongly recommend this hotel because it was easy to access to Melbourne CBD and the environment surrounding this hotel was quiet and peaceful. Moreover, when I stepped in the hotel, I found that the inside and outside architecture were quite great! Also, the hotel staff were efficient and friendly. Anyway, there is a delicious Sri Lanka restaurant close to this hotel. The reception girs are very helphelf, the rooms are clean but not very big. I only can use free internet for 100 mb,over 100 mb,it charged very high price.The taste of meal in the dinning hall is great,but it is more expercience.It is very easy to get a taxi and tram,there is a 7-11 store near the hotel.I can also chose some reasturants to eat near the hotel. Lovely hotel with great character and atmosphere.Staff very friendly and helpful as we had arrived early off a cruise and they managed to make the room ready very quickly early during the morning.Hotel close to tram stop for easy access to the city and also possible to walk to botanic gardens and shrine.We didn't have occasion to use the restaurant facilities but the dining room looked very attractive.Hotel provides car parking although we didn't need to use this on this visit. Would highly recommend hotel. friendly staff and nothing too much trouble. Good location. room had good amenities and bed very comfortable. we had dinner one night and the menu was varied and food delicious. would definitely stay here again. a delightful experience to stay in a hotel that has character and is not the usual stereotype of today's modern hotels. good out of town location but city centre only 1 km down the road.